Look up the definition of insurance and you'll find words like "reimbursement" and "compensation." That makes sense, since most insurance policies rectify losses by cutting you a check. In the case of jewelry insurance, a cash payout isn't always your best option. Read on for a comparison of how jewelry insurance works for a replacement policy versus a traditional reimbursement. Let's start with explaining the traditional insurance model. This structure is typical for jewelry coverage under most homeowners' insurance policies. Obviously there's a bit more detail involved than that, but the big question is how much that check will be written for. There are two main ways insurance companies can choose to value your compensation - actual cash value (ACV) and replacement cost. Jewelry is a unique case. It doesn't necessarily depreciate the same way a house or car does. According to the Insurance Information Institute, actual cash value "pays damages equal to the replacement value of damaged property minus depreciation." Alternatively, replacement cost "pays the dollar amount needed to replace damaged personal property without deducting for depreciation but limited by the maximum dollar amount shown on the declarations page of the policy." Generally speaking, you'll receive a larger payout at the time of a claim if your insurance is based on replacement cost, since most things depreciate. Jewelry is a unique case. It doesn't necessarily depreciate the same way a house or car does. That being said, normal wear and tear can affect the fair market value of jewelry, which is the baseline used to determine claims reimbursement in some cases. In either case, however, you're left to deal not only with the emotional toll of losing a sentimental symbol, but also the stress of trying to get an equal replacement for your original piece - which may or may not be easy depending on how well your provider understands the intricacies of jewelry. With specialized jewelry insurance like Jewelers Mutual, your insurance company steps in for you and deals directly with your jeweler of choice. 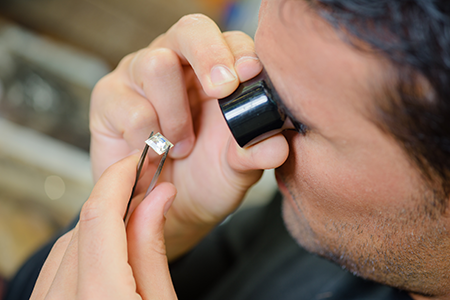 You don't have to worry about explaining every detail of your original piece to help the jeweler recreate an exact match. Jewelers Mutual employs jewelry experts that can use your most recently submitted appraisal to do that for you. Every option out there is perfect for somebody; it's imperative you figure out which is the best fit for you.